This page features my special boy CH. SAMWELLA LUTHER OF SERENAKER, he was my first Champion and he was also the first Champion bred by his breeder Mrs Pam Williams of Fareham in Hampshire. Against all the odds (including being a Tan & White Dog !! )he showed his heart out for me at all times, and never let me down. Luther was a dog in a million, he came to us at 15 months of age and left us all to soon at 12½ years of age. For the last 6 years of his life he was spoilt rotten by my parents Gary & Janet Parker, who are my much appreciated backroom support team. Another favourite of mine is Norcis Cornriggs, again a Tan & White dog but this one was so very headstrong!. We retired him at 3 years old after an accident put paid to his show career just as he was reaching his peak. Bondlea Piper of Serenaker, my first "proper" showdog, he won well at open shows & qualified for the KCJO finals at Crufts. 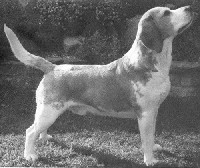 Another favourite sadly no longer with us is Louis (Deanound Tonnerre of Serenaker), he was my first PBGV & such a showman, in his brief career he won RDCC Crufts '98 - Mrs J. Walker, RDCC Bath '99 - Mrs S. Roberts, RBD Leeds '99 -Mrs Brenda Banbury & RBD Midland Counties '99 -Mrs Rose Phillips. We thank his breeders Yvonne Dean & Claire Gutherless for allowing us the honour of being owned by Louis.